US demand for plastic containers is forecast to increase 4.9 percent annually to $32.4 billion in 2016, consuming 14.2 billion pounds of resin. Plastic bottles and jars will remain the dominant segment but will be outpaced by other plastic container types, including tubs, cups, bowls and pails. Among the leading resins, PET will continue outpacing HDPE. 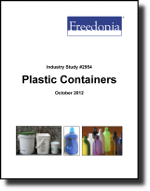 This study analyzes the 13 billion pound US plastic container industry. It presents historical demand data for the years 2001, 2006 and 2011, and forecasts for 2016 and 2021 by type (e.g., bottles and jars; tubs, cups and bowls; pails; trays; cans; egg cartons; squeeze tubes) and resin (e.g., polyethylene terephthalate, HDPE, polypropylene, polystyrene, LDPE, PVC). The study also considers market environment factors, details industry structure, evaluates company market share and profiles 29 industry players, including Reynolds Group, Amcor, and Plastipak.